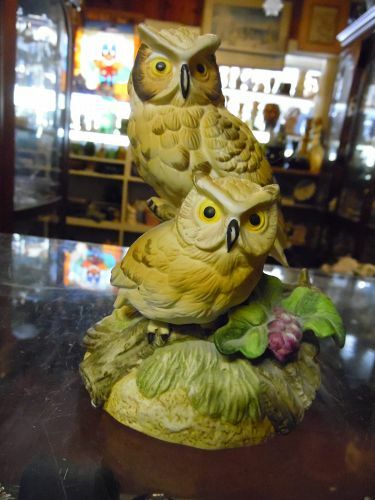 Homco owl double figurine 5 3/8 tall". Perfect condition with no chips or cracks. Partial sticker plus the HOMCO mark and 1404. Hand painted bisque porcelain. 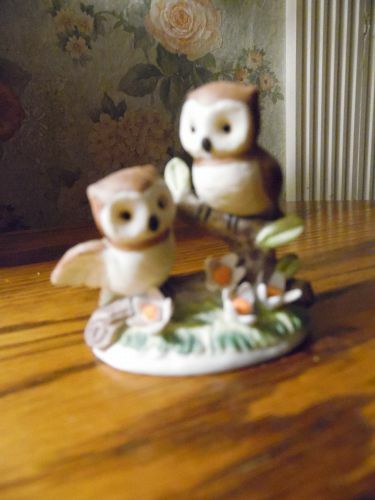 Adorable Enesco owl family figurine. 7" tall and made of hand painted bisque porcelain. 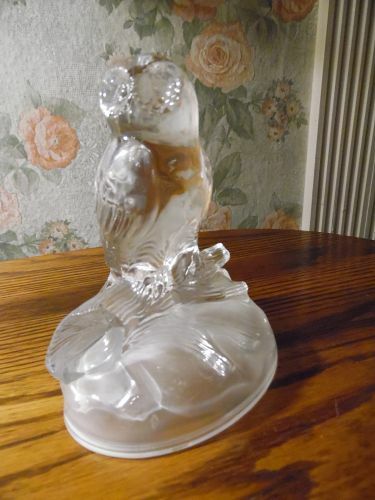 Foil Enesco sticker on the bottom, and figurine is also marked and dated 1983. Perfect condition with no chips, cracks or repairs. Vintage collectible weather thermometer. 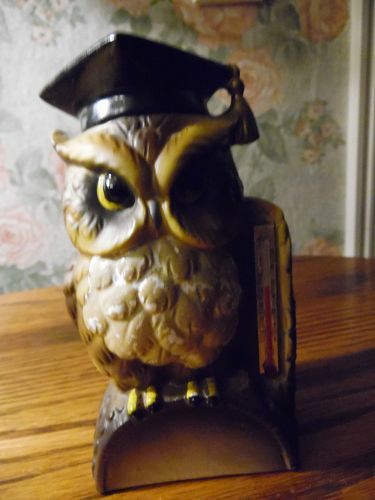 Wise owl standing on a log and wearing a graduation cap. Made of ceramic. No chips or damages but there is some paint wear on his breast feathers as seen in photo. No makers mark. 5 1/2" tall. 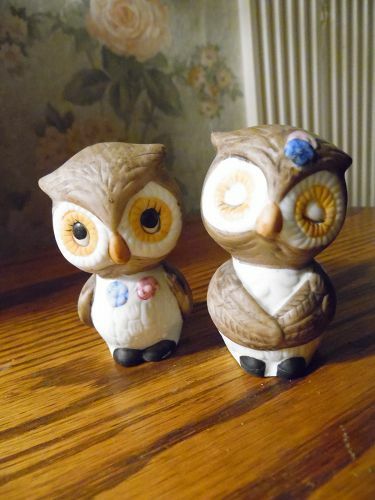 Sweet little unglazed bisque ceramic owl salt and pepper shakers. hand painted from Korea. Measures 2 3/4" tall. Original stoppers. Original stoppers.Perfect condition. 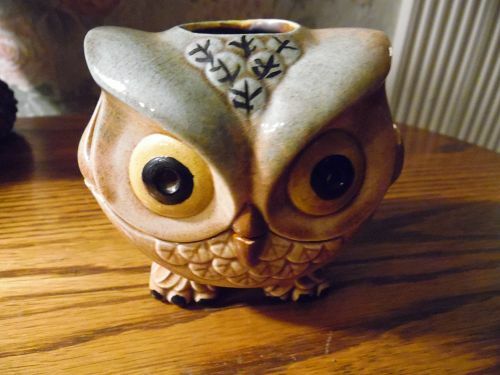 Two piece vintage owl luminary tea lite holder. Measures almost 4" tall. No chips or cracks. 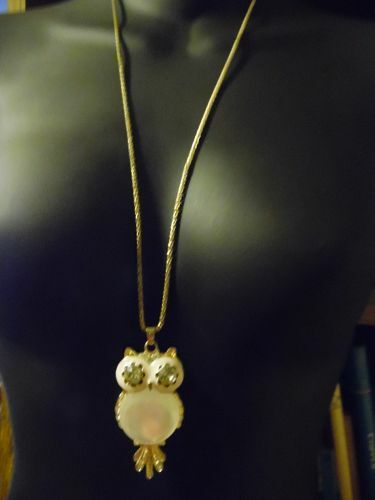 This is such a cute piece. Perfect condition. This is a great little teapot by Norcrest. An adorable little gray elephant made of glazed ceramic. The trunk is the spout and tail is the handle. Cute expressive eyes. 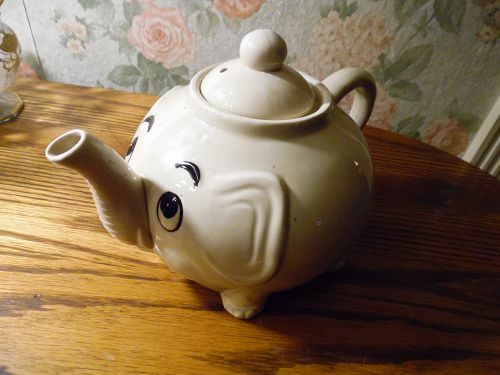 This at first glance looks like the Fitz & Floyd teapot, but there is subtle differences in tusks, eyes and the lid. Measures 6" tall to the tip top of the lid. No chips or cracks. Vent hole in the lid. Wonderful for that whimsical tea party or to add to your collection. 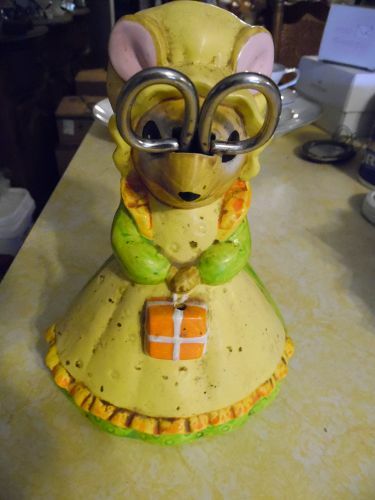 Vintage Lorie Design by Josef Originals Kitchen Mouse string and scissor holder/dispenser. A mouse in dress & bonnet holding a package. The dispenser measures approximately 5 1/4” by 4 1/4” and 7 1/4l tall. No damages.String and scissors are not included but just for props. The scissors would not be a large pair, having to fit a rectangle opening of 1/2” by 3/8” approximately. The string dispenses from the top of the package the mouse is holding. 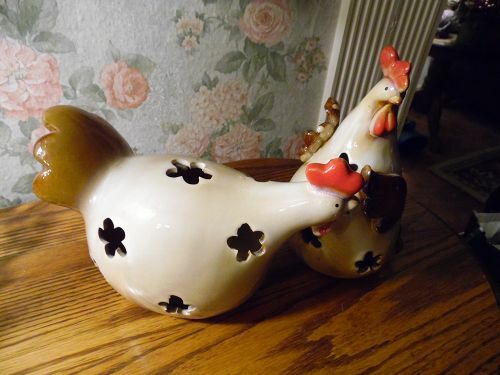 This pair of hen and rooster tea light holders are just fabulous. Brand new condition, so would make an excellent gift. Made of heavy glazed ceramic / pottery with cute flower cut-outs so the light can shine through. Tallest one measures almost 8.5" tall. Pristine condition. Sold as a pair. A fantastic Latte Mug, holds full 22 ounces that is great for Soup or Latte. Made of pottery with cool matte and shiny glaze contrast. This one has buffalo on each side. Signed by Mara, and from Mexico. This would make an amazing gift. 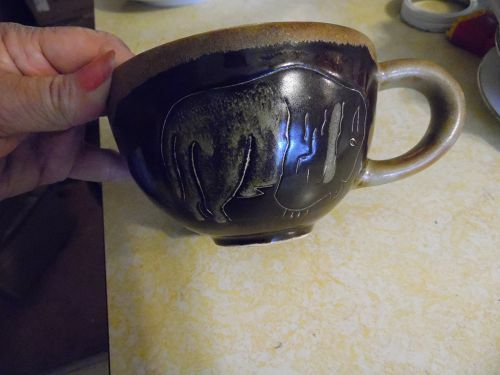 Pristine condition.3 3/4" tall and the cup area has a diameter of 5 5/8" not including handle. The handle is nice and room and will fit a mans hands comfortably too. 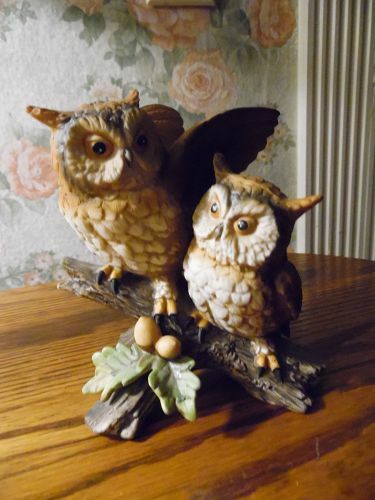 This beautiful little owl music box is 6 3/4 inches high and the round base is just over 4 inches in diameter. 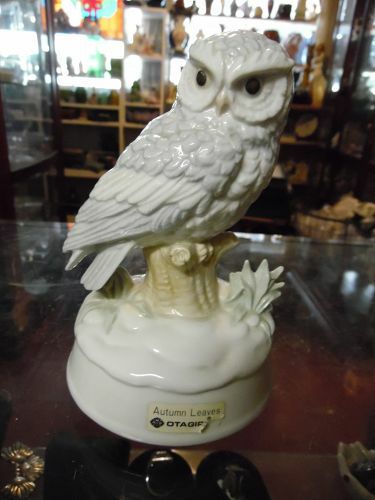 This lovely music box is in immaculate condition, as pictured and plays "Autumn leaves". The on/off switch operated perfectly too. 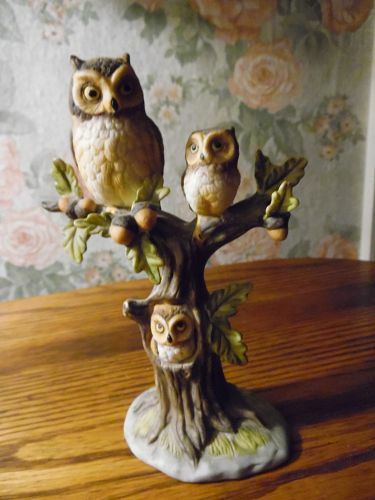 The owl rotates perfectly on the base. Original Otagiri sticker on the front and on the bottom. Also, printed is Gibson Greeting Cards Inc on the wood area of the music mechanism. 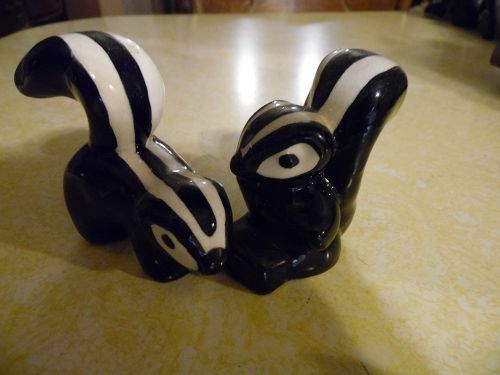 Adorable pair of sknunk figurines for the collector. 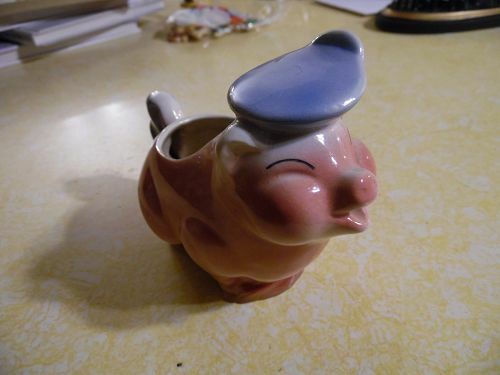 California pottery, but not marked. Ine is 3" tall and the other is 3 1/4" tall. 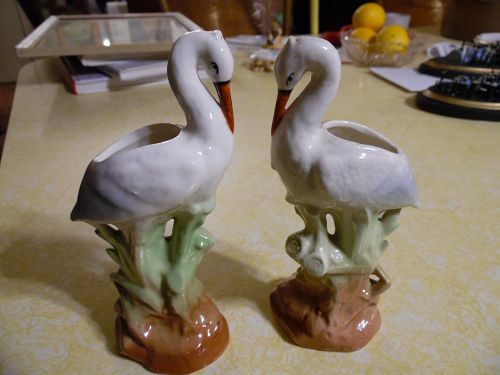 Hand painted under glaze and are in perfect condition.